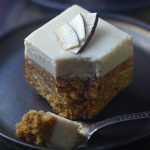 So admittedly there are several recipes of the carrot cake variety happening on this blog… and yet despite the abundance of carroty treats, I’ve been getting quite a few requests for a nut-free and oil-free version of these raw carrot cake cupcakes. As I never pass on an opportunity to eat more carrot cake, these squares happened the other day and they turned out quite tasty. 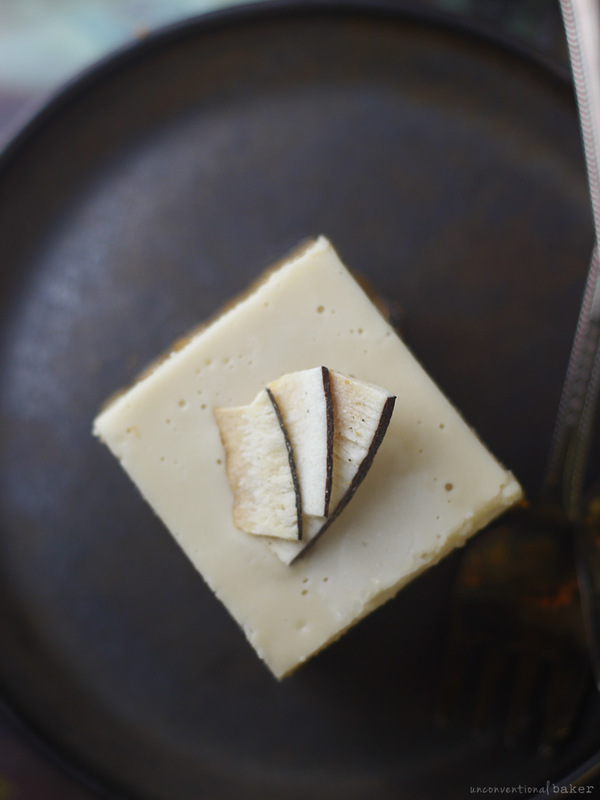 They’re actually a nut-free revamp of a previous raw carrot cake recipe — swapping out the nuts with the help of one of my favorite nut substitutes — thick toasted coconut chips — as well as my favorite super simple cream layer from these coconut cream bars. The result? Delicious. 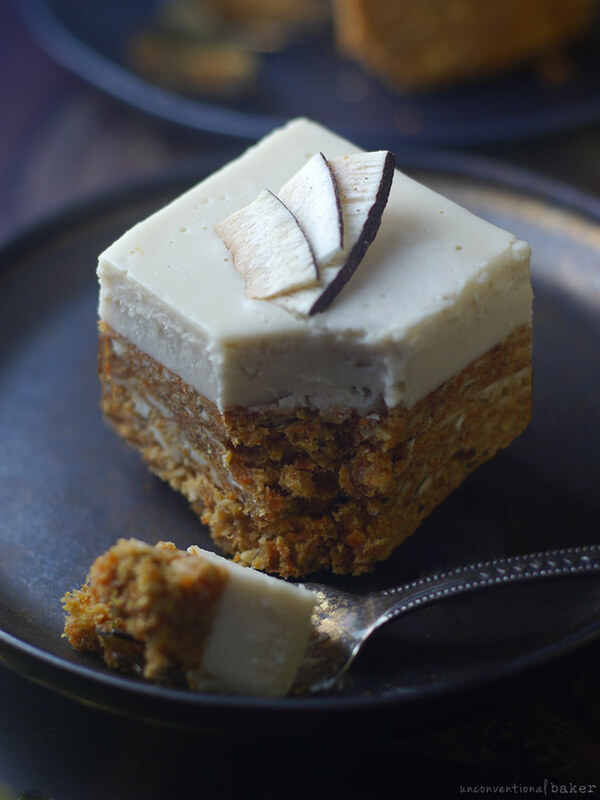 That cream layer can do no wrong in my eyes :) and it’s so lovely with the slightly chewy texture of this no-bake carrot cake base. 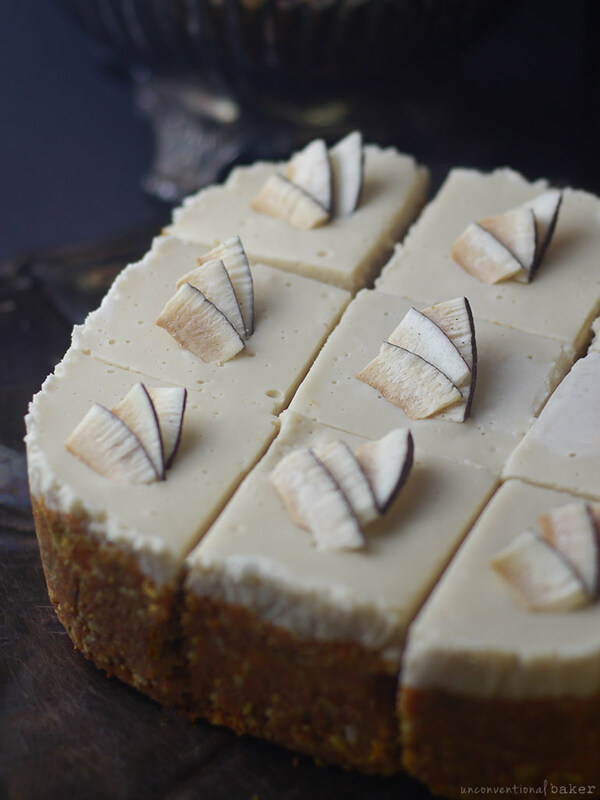 Plus coconut + carrot cake are a perfect pairing. If I had some dried pineapple rings, I’d chop them up and toss them into the “cake” mix too, but alas I had none on hand — next time! These look cute in sliced square form, but also work great in mini cupcake form. Just be sure not to over-fill them with the base so that there’s room for the filling to go into the pan if you go that route. One quick note before you head over to unbaking these little guys: to keep this cake oil-free (as requested) I used coconut manna in the “cake” base, but if you prefer you can just use coconut oil there and it’ll give these a bit of a firmer consistency. But in the frosting, you’ll need the manna, as it’s what gives this no-bake “cake” the creamy, delicious, and super satisfying edge. 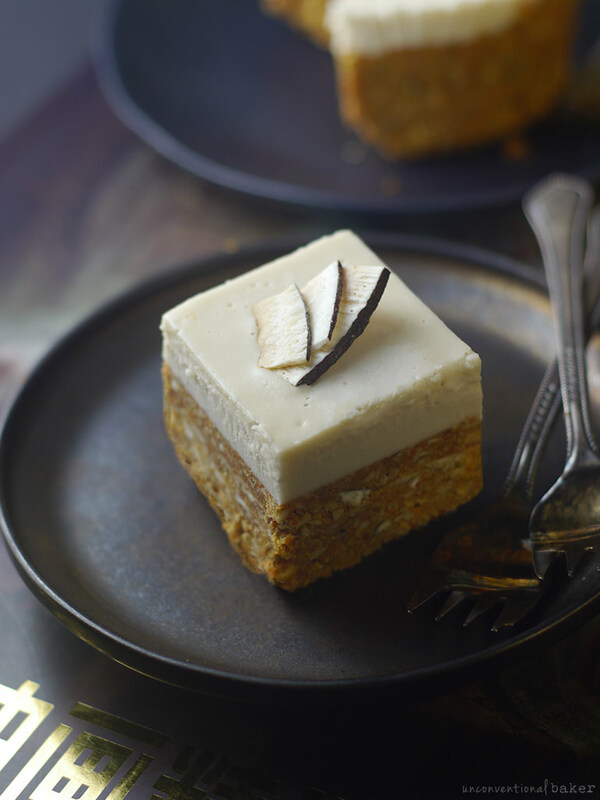 A nut-free version of a no-bake vegan carrot cake, topped with a deliciously smooth layer of coconut cream. 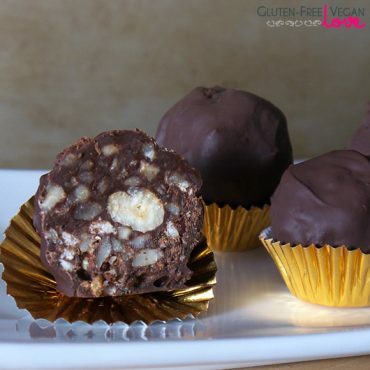 This recipe is gluten-free, grain-free and paleo, refined sugar-free, nut-free, and can be made raw and with no added oils (see notes). Line a 6″ x 6″ container (or something of a similar size; alternatively can use silicone cupcake molds) with parchment paper along the base and walls. Set aside. Process all cake ingredients in a food processor into a finely crumbled/sticky mixture (be careful not to over-process into a paste though). Transfer this mixture into the prepared container and press it in into an even layer with the back of a spoon. Cover with a piece of parchment paper and use a flat-bottomed object (like a jar lid) to smooth out the top and pack it in even more firmly into the container. Place the tray in the freezer while working on the next step. Make sure all topping ingredients are at room temperature (it helps if the coconut butter is slightly warmed so that it blends more easily). Blend all cream layer ingredients in a small blender (I used my magic bullet for that) until smooth. Pour this mixture over the prepared crust. Smooth out the top and tap the container on the counter lightly to flatten the top some more. Freeze for 10-15 minutes to firm up slightly. After the initial 10-15 minute freezing, remove the cake and decorate with some coconut chips (optional). Return to freezer and freeze for 4 hours or overnight to fully set. Once set, remove from container and cut into slices (it’s best to slice the cake while it’s frozen or only very slightly thawed out). Enjoy! *For the coconut chips, you’ll want to use ones that are as similar to these in texture and consistency (crisp, thick, and nicely toasted). 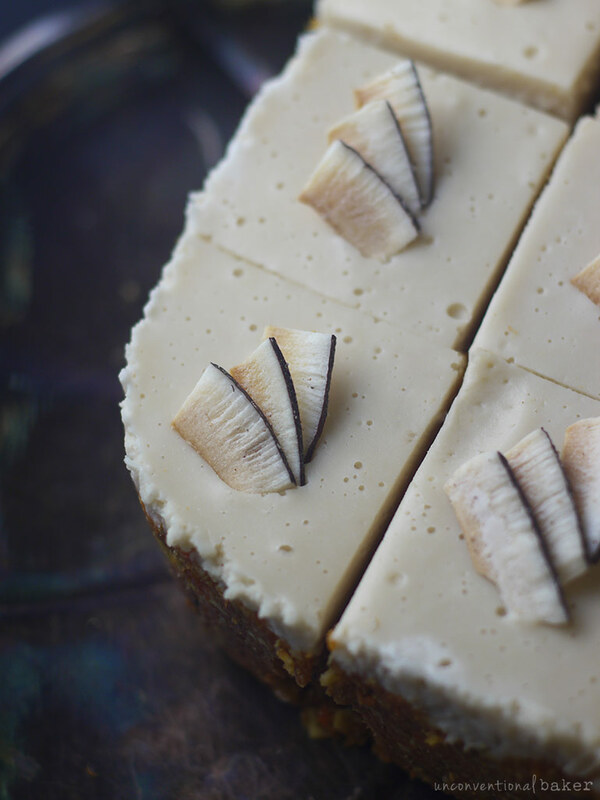 They add a good dose of coconut flavor to this cake. I used these. You can usually find them at health food shops and the natural aisle of many grocery stores, or online (amazon or iherb etc.). If you can’t find those, look for something similar, just keep in mind that if you’re using finer chips, for example, you might need to make a bit more of the crust as they’ll process into a finer consistency. Alternatively, if you prefer, you can use sliced almonds or other nuts / seeds of your choice. **Coconut butter / manna is a product made by the blending of shredded coconut (sort of like a nut butter, but from coconut). It’s not the same as coconut oil. A common brand available in stores in North America is Nutiva. 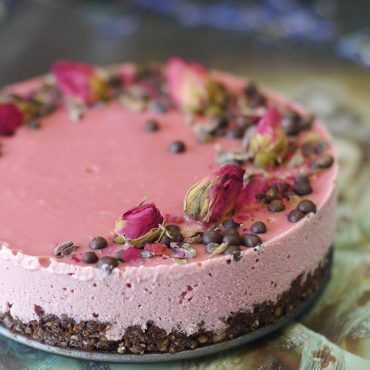 You can also make your own at home if you’ve got a good food processor (there are instructions and a video tutorial on how to do that in my book Unconventional Treats). Storage notes: After setting and being sliced, the cake can be kept in the fridge or can be frozen and thawed out as needed. To make this recipe raw: use dehydrated thick coconut chips similar to those used in the recipe (or alternatively can use sliced raw almonds or other nuts / seeds). For the sweetener, use a raw alternative like raw agave or raw coconut syrup in place of the maple syrup. To make this recipe with no added oils you might want to omit the raisins (depending on your sensitivity level) as they are typically sprayed with a very light amount of oil. It’s quite a negligible amount, so unless you’re particularly sensitive to oils, it shouldn’t be a bit deal to use them. Disclaimer: this post contains affiliate links to the following products: thick toasted coconut chips, raisins, coconut palm sugar, medjool dates, coconut butter, cinnamon, nutmeg, salt, maple syrup, pure vanilla extract, silicone cupcake molds, parchment paper, food processor, magic bullet. I made this today and it was delicious. My two year old helped me make it and gobbled it up. It really does taste like carrot cake. I love the icing with it. It really makes it. Thanks for such a delicious and easy treat. Thanks for the lovely feedback, Emily. I’m so glad you enjoyed it. And I agree — the icing is my favorite part here. This is really, really delicious. I can’t believe how much the frosting tastes like classic cream cheese frosting. It’s wonderful. Thanks for another great recipe. This looks so lovely though. Hi Bunny, I understand. I have many readers who are nut-free or coconut-free, and of course coconut is a convenient substitute for nuts in many ways. Also, for oil-free recipes coconut products can be a good whole-foods based source of fat. I can see how it can be challenging to be coconut-free and oil-free while wading through recipes.